Did George M. Pullman have an illegitimate son? 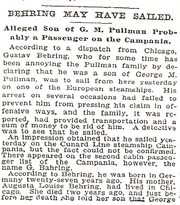 Throughout the 1890s, a man named Gustave Behring pressed his claim that he was Pullman's love child. According to the Cedar Rapids Evening Gazette, December 14, 1897, Gustave Behring, 28, was a sergeant in the German Army when he was called to his dying mother's bedside. On her deathbed, she confided in him that his real father was none other than George M. Pullman. She showed him the letters that Pullman had sent her, promising “to care for her child” and commanded her to son to convey to his father that she still loved him as in her youth and wished to reaffirm her vows to him. According to her story, she and Pullman became “acquainted” while Ms. Behring was a governess in Chicago for a house on the west side. They were intimate for over a year, according to her love letters, and Pullman promised to marry her many times over the course of the affair. When she became pregnant, Pullman allegedly packed her off to her native Germany , supplied her with $500, and told her to lay low for a while. She never heard from him again. Behring later claimed that Pullman had actually married his mother in 1867, living in Chicago under the assumed name of Schmidt. BEHRING: You are my father! PULLMAN: You are a crazy man! BEHRING: Mother told me to come all the way from Germany and tell you of her death. PULLMAN: I do not know you or your mother and don't bother me! Pullman died on October 19th. Less than 12 hours after the funeral, Behring showed up at the family's residence on Prairie Avenue, demanding to speak to Mrs. Harriett Pullman (George's widow). Apparently, he was met on the steps by Pullman's sons and the family lawyers, all of whom were nonplussed as to what to do with this man. He was eventually arrested again. On October 29th, according to the Los Angeles Times, Gustave Behring was “examined by an insanity expert today, who pronounced the man sane. He was accordingly discharged from custody. 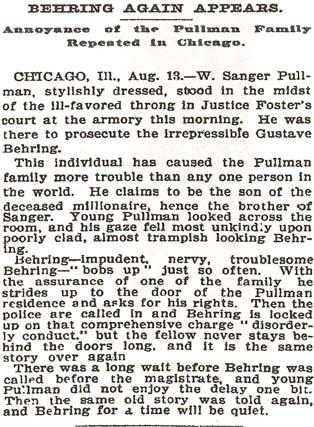 Behring declares that he will push his claim against the estate of the dead millionaire.” Behring faced another sanity hearing, presumably after yet another arrest, on April 21, 1898. According to the Chicago Tribune of April 22nd, he was again declared sane in the court of Judge Jones. On August 14, 1898, the New York Times reported that Walter Pullman (Pullman's son) was in court prosecuting Behring before Justice Foster. Pullman secured a restraining order against Behring. 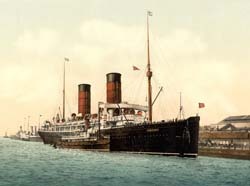 The New York Times of September 18, 1898 reports him being escorted to the Cunard liner Campania by detectives, bound for Bremen. 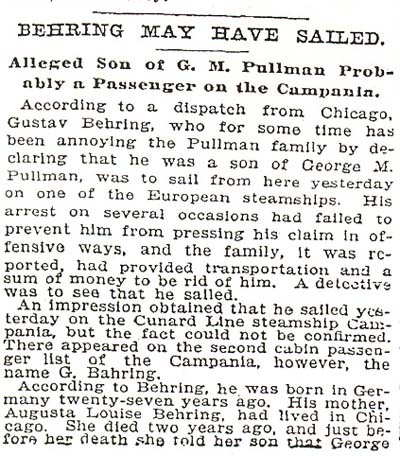 He either returned to America to press his claim or never made it to the ship, because on June 25, 1901, Behring was again arrested at the law offices of Frank Lowden (Florence Pullman's husband) demanding $5,000 in cash and $10,000 a month for 6 months. Judge Davis, Lowden's partner, held Behring at gunpoint until the police arrived and placed him under arrest (New York Times).